Kate, Andrew and Toby arrive Monday 19th. Stay at Furano at Young House for 2 weeks with Kate, Andrew and Toby. We will stay on. and fly home on 26th March arriving Sydney Friday morning. 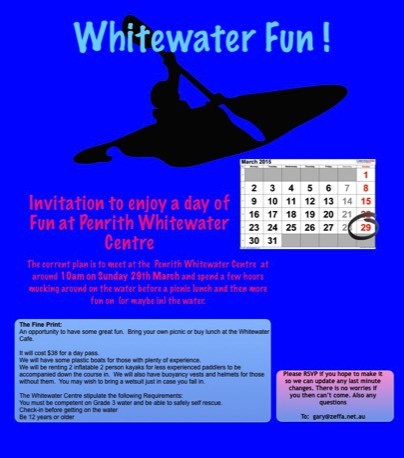 Rafting and Paddling at the WW Centre with picnic lunch and hopefully lots of fun, with no experience necessary. Also it will be a chance for me to blow out 60 candles, if there is a cake. There is a cost for using the WW course, maybe $30 or so. This is not yet a definite plan but it is what we are hoping to do. This is the date, or thereabouts that we will move back to our home in Shellharbour after about 2 1/2 years away. 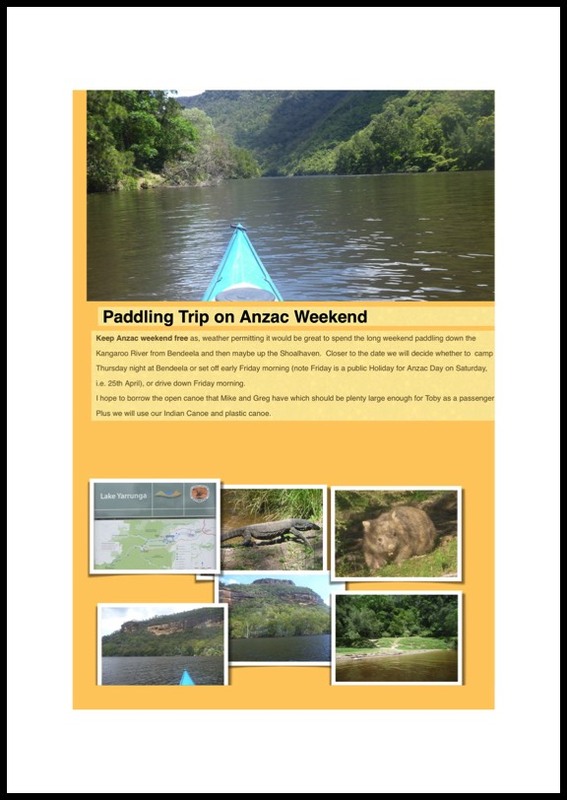 Anzac weekend, hoping to do a flatware paddle from Bendeela in Kangaroo Valley down to the junction of the Shoalhaven river over the 3 days. This is the Queens Birthday weekend although we will probably stay longer. Definitely a week or two at Beachcombers plus whenever it is good over July August and September. Bike Friday get-together which we are helping organise based at Shellharbour. The is the Canungra Cup, a 9 day paragliding competition near the Gold Coast. Probably leave early to drive up. Highland Fling: Annual Mountain Bike Race of about 113km. Nearly 6 week trip to New Zealand currently in the planning stage with hiking the Routeburn Track and MTBing in around Queenstown and Wanaka as well as maybe in the North Island around Rotorua. Slalom National should be in Tassie in early January and we will probably take our van over and do a range of other activities after the paddling. Skiing in Hokkaido, Japan for February and maybe early March. We may then set off overland with our bike to Europe to visit Sara.